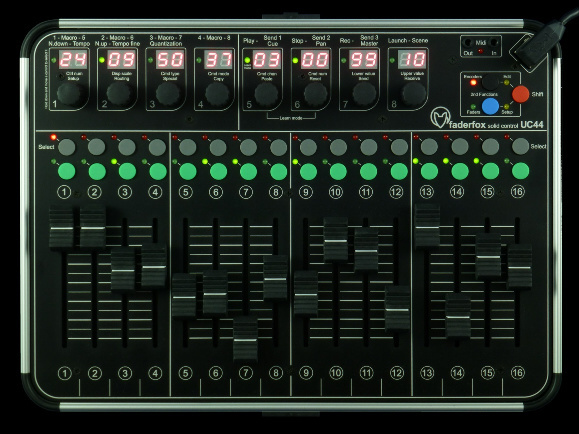 The all-rounder has 8 push-encoders each with a 2-digit-display, 16 faders (60mm) and 35 buttons. The encoders (with detents) are switchable to 32 groups which allows to control a total amount of 512 control parameters. 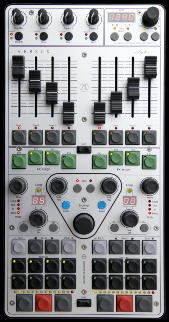 Various kinds of midi commands like program change, pitchbend, aftertouch and control change in relative and absolute mode with different acceleration amounts and min/max values are possible. 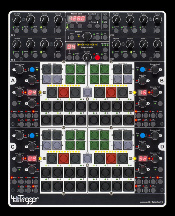 All these properties are fully programmable on the devices very fast and easy for each control separately. Use the internal 8 setups to save your individual settings. Backup and restore of all settings by sysex dumps are possible too. The flat box is also a great extension for your Ableton Live setup. 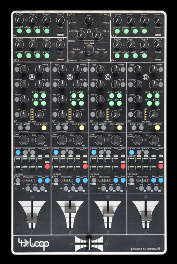 There you can control all the continuous parameters like track volumes, rack macros, send amounts and switchable parameters like clip launch, mute and track select. A special control surface script for Ableton Live 8/9 with all necessary mappings to control 16 tracks simultaneously is enclosed in the package. Latest Firmware UC44 Version 02.02 (UC44 V0202.SYX) ! read update instructions first ! Older Firmware UC44 Version 01.00 (UC44 V0100.SYX) ! read update instructions first ! Older Firmware UC44 Version 02.01 (UC44 V0201.SYX) ! read update instructions first !